Everything you need to know about visiting the seriously-off-the-beaten-track Banda islands in Maluku. 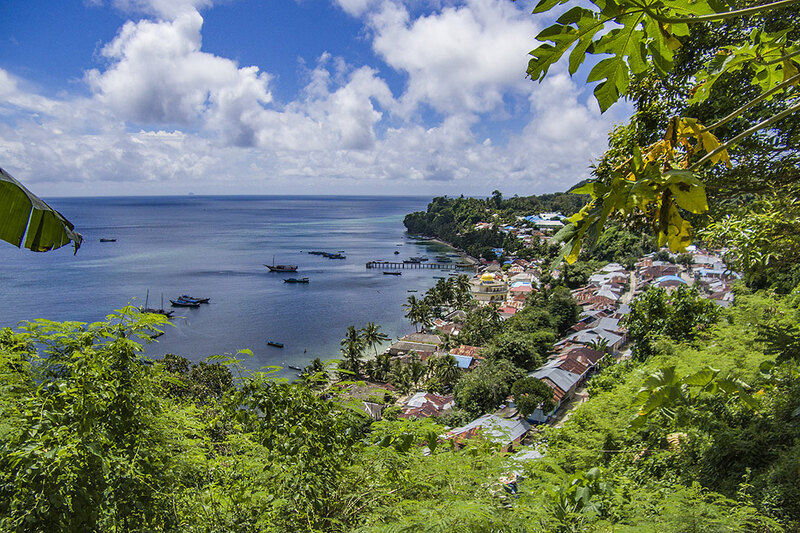 In the very south of Maluku lie the remote and hard-to-reach amazing spice islands: the Banda islands. In this country with more than 15.000 islands, this little archipelago is one of the most incredible you’ll find. Were it not for its isolated location, this would be one of the hotspots of the country. In coming years that’s bound to happen as transport is improving. 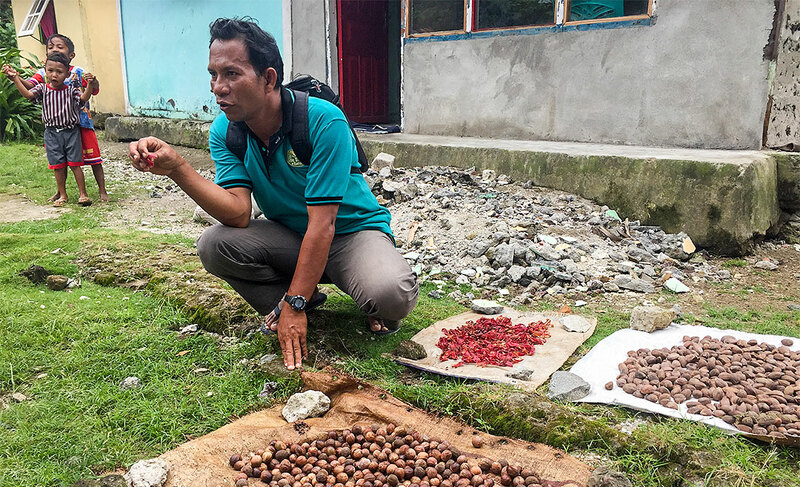 The Banda islands have a rich history as the spice islands, famous for especially nutmeg, but also cloves, almonds and cinnamon. First colonised by the Portuguese, the Dutch soon took control of the islands and fought the Spice Wars with the British. In the Treaty of Breda in 1667 New Amsterdam was traded by the dutch for Rhun island, to obtain a monopoly of the Banda spice islands. I joined 3 tours at Cilu Bintang, which were excellent. Abba can arrange anything you want. There are public boats going to Hatta, Ay and Rhun almost every day, but not between those islands. There is no set time, you might have to wait hours. Some might say it leaves at 2pm, but it might actually leave at 11am when it’s full. And if the weather is bad or there aren’t enough people, it won’t go. It’s all such a surprise here! You can charter a boat yourself (seems quite expensive) at the terminal or ask your host to arrange it. The Banda islands are famous for their great diving. Unfortunately I didn’t get a chance myself. In rainy season, even in great weather, there isn’t much diving going on. The seas are just too rough and visibility isn’t that great. You’ll find a few dive shops near the harbour and Banda Neira and at Hatta island there’s one behind Sarah Guesthouse. 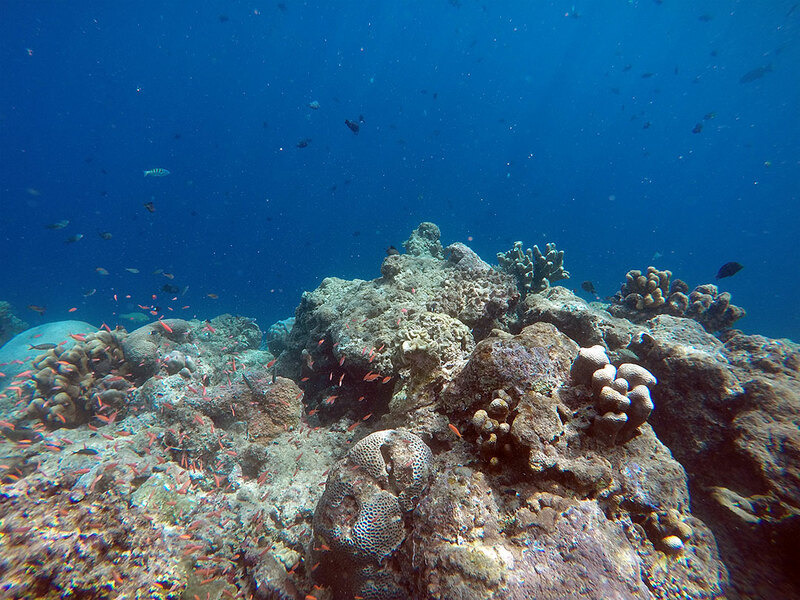 Banda Neira & Besar: Although possible to go snorkelling, these 2 islands aren’t the best place for it. Hatta island: The best snorkelling in Banda is found right at the beach of Hatta. The drop-off is very close and you’re right in the action within a minute or two. You can spot turtles, white tip sharks, moraines, napoleon fish etc. There’s seriously a lot of fish here and great coral, it’s one of the best snorkelling spots I’ve ever been at. 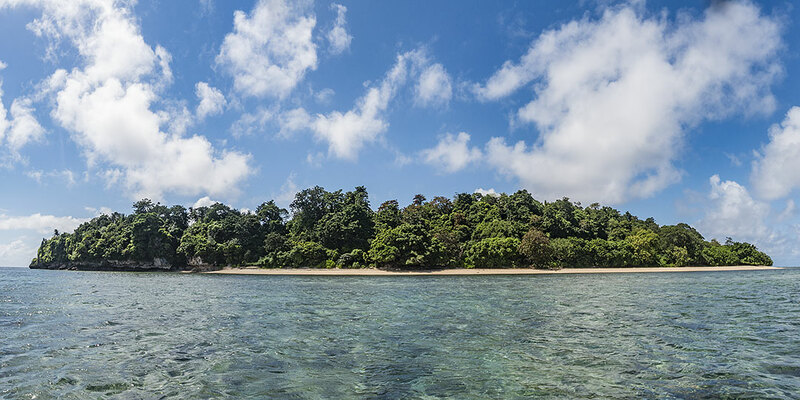 Rhun & Ay island: Although you might be able to find some decent snorkelling near the beach, you’re better off organising a boat or joining a day trip from Banda Neira to snorkel at the best locations, in combination with visiting the islands. Trips usually only go to 1 island only, so you’ll have to do 2 trips. I payed IDR250.000 per trip. Tip: If you’re going on a day trip to Rhun, the second snorkelling location will likely be at the small deserted island nearby. Make sure you go out a bit far to find the good spot. In our case, we had no idea, the boatman didn’t tell us, just dropped us of at the beach. So our group was all over the place. Only the ones that found the good spot, were really enthusiastic. Banda Api: Lava Flow is the best location for snorkelling around Api, you’ll need a boat to take you there. But if you’re doing a day trip, you might have them take you here at the end. I went here after the Spice Tour at Banda Besar. What’s interesting about this place, is that coral has been growing exponentially on the lava since the last eruption in 1988, to the surprise of scientists. There are a few forts to visit, some museums, nice colonials buildings, a shopping area near the harbour. Just walking around the island is nice by itself and you’ll come across all these things. There’s a beach at the north (an hour walk), but it’s not very great. Alternatively, rent a motorbike to cruise around, you can see it all in a few hours. It’s a very nice drive! Visit this island for the Spice Tour, a guide will take you around and tell you about the nutmegs, cloves, almonds, cinnamon etc. 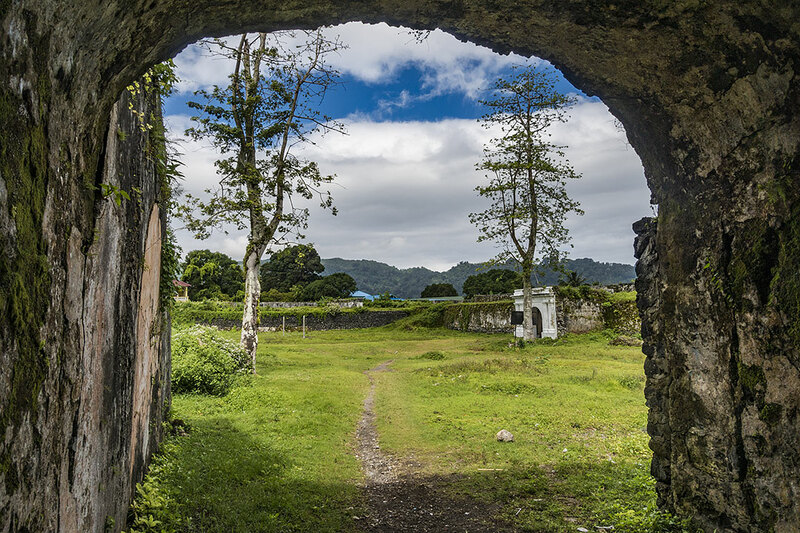 You’ll see the town and plantations and learn about the history of the Spice Islands. It’s an interesting tour that you should really do. Price depends on the amount of people, but probably between IDR150.000-25.0000. Combine it with snorkelling at Mt Api, just ask them to take you there. The active volcano that last erupted in 1988. You can climb it in 3 hours. Locals will advise a tour guide, but it’s very doable by yourself. Just ask where the trail starts. Be careful, the gravel can be slippery, especially on your way down. Go to the ‘small boat terminal’ to arrange the short trip to the island. Best spot for snorkelling and some beach time. Very laid back place where you can easily spend a few days to a week. Public boats between Hatta (leaves 7-9am) and Banda (leaves 11am-2pm) go most days, but are sometimes cancelled because of the weather. Takes an hour, costs IDR20.000. Small laid back island with some decent snorkelling around the island. Join/organise a day trip or take the daily public boat and spend one or a few days at a guesthouse on the beach. Takes 30min, probably IDR10.000, leaves around 7am. Another laid back island with some decent snorkelling near the main town. You can catch a public boat from Banda Neira (leaves 11am-2pm) and returns at roughly 7am. It might be it leaves one day, returns next day, but I was told the same about Hatta and there were daily boats after all. If you want to visit Ay as well, you should ask the boat from Rhun to Banda Neira to drop you off at Ay. There’s no boats between Rhun and Ay. I did a day trip to Rhun, which was great. We had a tour guide take us around the town and forest. We then had lunch and went snorkelling twice (IDR250.000), second time at the nearby deserted island, read the tip at the snorkelling section above. The Mutiara is a very nice, old colonial house with classic furniture. The rooms are spotless, have a shower, fan and airco. The two large rooms are IDR250.000, the small room is IDR200.000. Free breakfast is served at Cilu Bintang, which is run by the same owner, Abba. Cilu Bintang Estate (also called Mutiara 2) is a brand new colonial style building. It’s a fantastic place and the best to stay at. It’s very large, has a nice balcony to relax, gift shop and desk with local items and books, restaurant (Abba’s wife is a great cook, although she doesn’t always do the cooking). When there are many people, they do a dinner buffet (IDR100.000) which has excellent food. Free breakfast, but that goes for most places in Indonesia. Rooms are IDR400.000/500.000/800.000. The second picture below is the ‘standard’ room. Delfika Looks nice, has a great inner courtyard/restaurant and serves good food. It’s close to the port as you walk passed the mosque and turn right. Rooms IDR200.000. Other places Near the port there are a few places, turn left for Maulana, a large colonial building at the water. The menu is quite expensive here though, accommodation probably as well. Good place to have drink though. Turn right from the port to find a small hotel. Walk a few hundred meters furthers to find the ‘small boat terminal’, next to it are 4 guesthouses. Walk or ask around for even more options. Maybe you’re able to stay here, but there’s not much reason to. There are a couple of places on the beach to stay at, I was recommended to stay at Sarah Guesthouse. It is run by Adi and his short, lovely wife Sarah. She is said to be the best cook on the island and I believe it! The food served was great with many different dishes. IDR250.000 per day including 3 meals, this goes for all accommodation on the island by the way. Rooms are basic, just a bed and a table, bathroom only has a toilet and you wash with a bucket of water. You have a front porch with a beach & sunset view, free water, coffee and tea. What else do you need? Oh yeah, electricity maybe, that is only available from 6pm to 11pm! Be warned, you will probably want to spend more time here than you intended to. There are a few guesthouses, Manhattan is the recommended one. I didn’t stay here though. There are a few places on the beach to stay at, which would be a nice quiet retreat if you have the time for it. 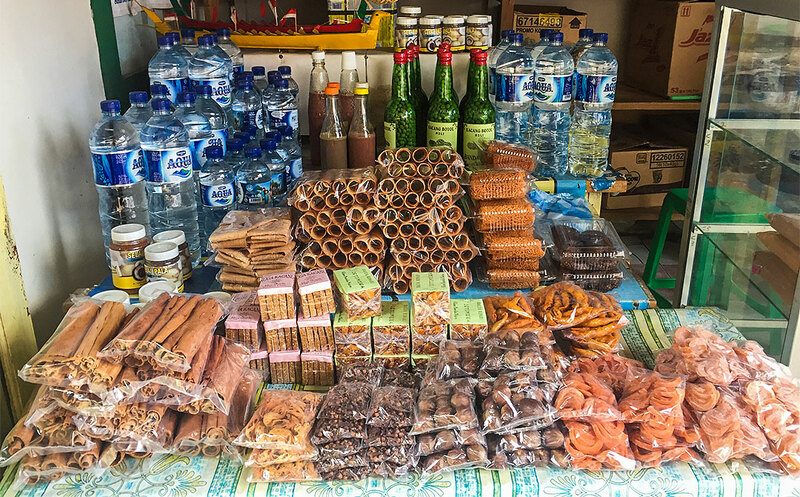 You are at the spice islands, so you should definitely try some of the local foods and drinks. Try nutmeg coffee, nutmeg juice, nutmeg jam on pancake or toast. There’s even nutmeg soup. You’ll find nutmeg and cloves in many dishes actually and the fruit of the nutmeg tree is sold as a dried sweet snack, called Buah Pala. At the harbour are there are many street stalls selling fresh grilled fish and vegetable dishes, try the tuna on a stick! Not sure if it’s local, but the fried eggplant with peanut sauce was delicious. Try some of the local cinnamon and almond cookies. There’s probably more things that I haven’t seen or tried. If you do the Spice Tour, you’ll get to try some fresh cinnamon and almonds, which are very nice. Chew on some of the plant leaves, they give an interesting taste! Although not particularly local, all the fruit shakes here were among the best. There are many restaurants at Banda Neira, I’ve been at quite a few and thought all had good (or at least ‘interesting’) food. I missed eating at Delfika, which is said to have great food. I ate often at Nutmeg Cafe near The Mutiara, which served good food for a good price. Cilu Bintang is a great place to eat at, although some reports about the soup and salad weren’t that good. In my case a few times they forgot the second part of my order. My advice, just try out many places, even the local street-food is amazing. There’s not many restaurants at the other islands and food is likely served at your guesthouse. June to August and rainy season and January doesn’t have the best weather. Weather gets better in August though. October to December are high season. I spent 20 days at Kei and Banda in the beginning of August, only a couple of times it rained for a few hours straight. Most days were great and a couple of times it would rain very shortly. It wasn’t too bad at, but July was much worst according to others. From Kei islands you can catch a Pelni boat (once every 12 days) to Banda or vice versa. From Ambon there is a twice-weekly fast boat, 3 slow boats and some flights. Sounds easy right? Well, not really, especially not in the rainy season. I had a lot of trouble getting the right information in Ambon (everywhere in Maluku actually). In hindsight I should have gone to the tourist information office. So if you need info while at Ambon, go there. Find the Pelni schedules at www.pelni.co.id and Banda Neira’s dive shop Blue Motion has up-to-date info at www.dive-bluemotion.com/getting-here. In off season there’s only 1 flight a week to Banda, on Wednesday (IDR350.000, book at the Dimonim office at the airport in Ambon, www.dimonimair.com). But…. if the weather is bad, it’s cancelled. If there aren’t enough people it’s cancelled. But usually it’s fully booked, so it’s hard to get a ticket last minute. It might be the plane flies between Amahai and Banda only, from Amahai it’s a 2 hour ride on a fast boat to Ambon. Note that you are only allowed to bring 10kg of checkin luggage on these small planes. The fast boat (roughly 6 hours) leaves twice a week, but in rainy season it doesn’t go at all. Waves are just too rough. When it does leave, you can buy your ticket before boarding at the Ambon Tuhelu harbour (IDR415.000 or VIP IDR650.000). From Ambon it leaves 9am at Tuesday and Saturday. From Banda it leaves 9am at Wednesday and Sunday. The slow boats each have a different route and schedules are made at the beginning of every month. That means it’s very hard to find out beforehand when you can take a ship. Nggapulu (8 hours, IDR105.000) and Pangrango (12 hours) travel directly to Ambon. Leuser (20 hours) goes to Amahai in between. The Nggapulu travels a long route between Surabaya (Java) – Makassar (Sulawesi) – Ambon/Banda/Kei (Maluku) – Sorong (West Papua). It’s the biggest and most comfortable boat though. Opt for a cabin. Beware: theft occurs near and on the Pelni ships. Keep your eyes on your stuff at all times, especially watch your wallet. Groups of thieves operate on these ships. I had been warned several times and as aware as I was, they still managed to steal my e-reader from my pants’ side pocket, while we were standing in line to get on the boat in Kei. Even though I had my backpack against my leg to protect it almost the whole time, had my friends behind me ánd was keeping an eye on the guy next to me (who had a small plastic bag in his hand), someone still managed to steal it. There’s only 1 ATM at Banda Neira, but bring enough cash anyway. 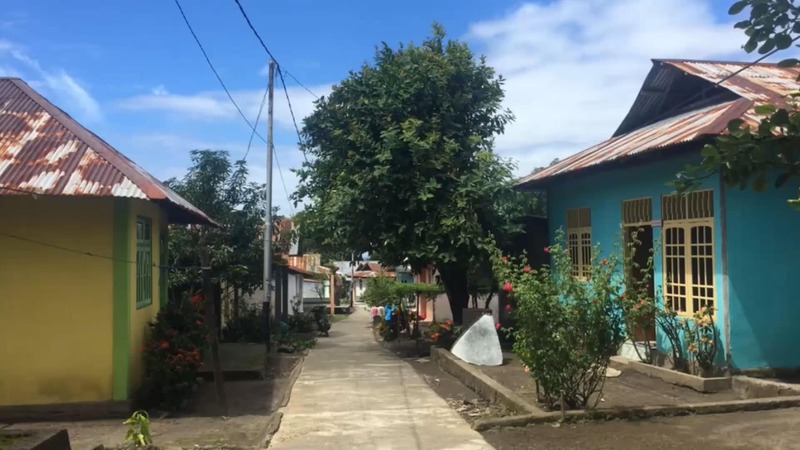 Banda Neira is the only place with internet, the other islands barely or don’t have a phone signal. Booking ahead isn’t even possible here, except for some places at Banda Neira maybe. But even in high season I’m sure you’ll find a place anyway. It’s a wise idea to bring an Indonesian phrase book, many people speak barely any english and it can be difficult to communicate. If you’re prone to sea-sickness, bring tablets. Particularly the ride to Hatta is rough. You’d make some kids really happy if you bring them some toys like frisbees. The Banda islands are an amazing archipelago full of history and remains of the colonial times. 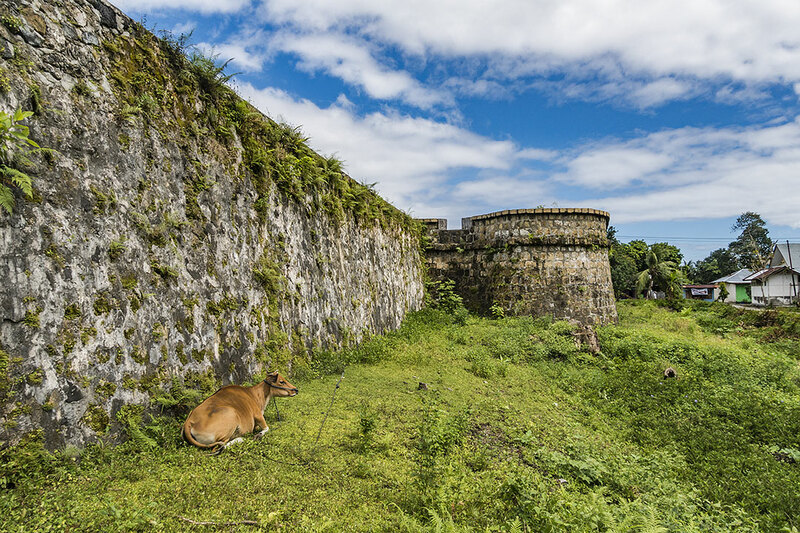 The old architecture, forts and other remains of that era remind you of a time when things were so different in the world. When the Dutch, English, Spanish and Portuguese were discovering new places and conquering new lands, killing the poor people and forcing religion on them. Crazy times, I’m happy to live now and visit these places in peace. The Banda islands are difficult to reach, especially in off-season, but thanks to that it’s a place unspoiled of mass tourism. If it weren’t for the remote hard-to-reach location, I’m sure Banda would be one of the top destinations in the country. The locals are some of the friendliest I’ve come across and the islands are wonderful laid back destinations. The food has been fantastic and it’s great to try out all the spices in different food and drinks. 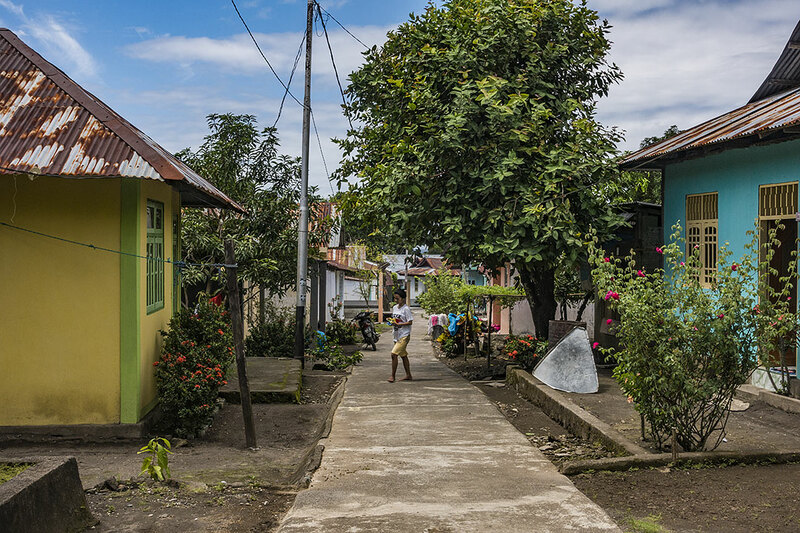 I’ve really come to love Banda and I will remember it as one of dearest travel experiences. On average, per day (for 11 days), I spent roughly IDR200.000 on accommodation, IDR100.000 on food & drinks and IDR100.000 for travel. Getting around isn’t easy, trying to find out when the boats leave to the islands is a nightmare. Everyone tells a different thing. Even at the terminal when you ask for a certain boat, it might happen that several people say there isn’t any that day, while there actually is. In off season boats get cancelled often. And when it goes, you will have to wait for hours before it leaves to make sure you’re on it. If your budget allows it, you’re better off with joining trips (and have them drop you off at the island at the end of the trip) or chartering boats. Fascinating! I love when a new place is put on my radar, especially one as beautiful as these islands. The tie in with spice tours as well as the water activities would be a wonderful way to spend some time. Thanks! I love the idea of remote places… Thank you that gives me lots of inspiration for my 2018 trips! Thanks, check out the Kei islands post as well. They’re east of Banda and attract even less visitors! Nice blog post! It feels like I actually visited through the photos. I’ve only heard of Banda Aceh, so the others I had to look up. I love learning about off-the-beaten path places. Thanks! Thanks Jackie! Hope you make there some day, it’s a great and unique place. Love the video, really felt like you there zooming around! 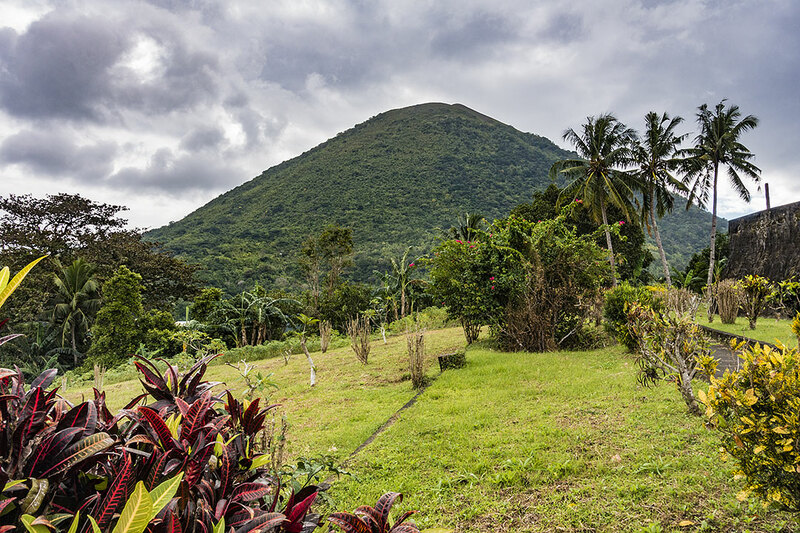 I would love to go diving or snorkelling and diving, some great info on where to go for this, Banda Api sounds like a winner though and the active volcano looks like a fab hike. The photo of Hatta Island is top class. Great article! What a kind comment, thanks so much Vanessa! Wonderful post! So informative and helpful, I learned loads reading your article and loved the photos. Looks like a lovely, refreshing place to visit. I especially liked your ratings at the end. 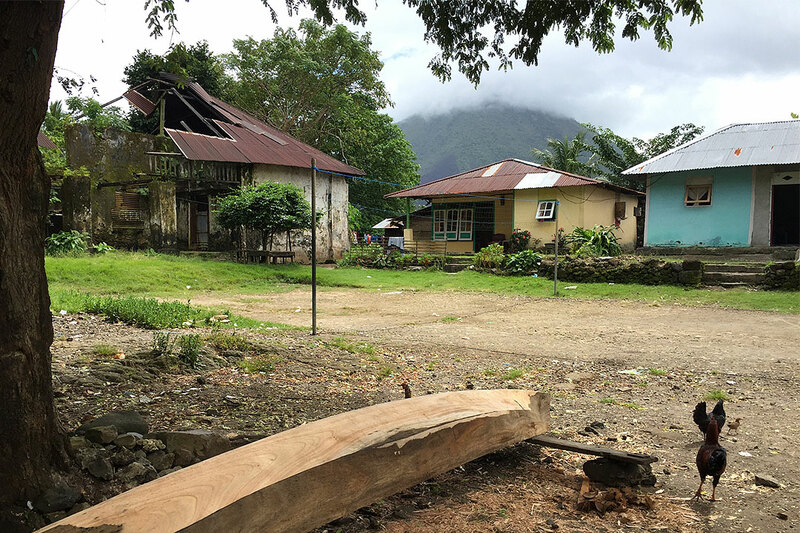 The Banda islands are amazing – I need to visit before it becomes a hot spot! Seems a bit tricky to get to but definitely worth it. Snorkelling looks fantastic there and would love to dive. Thank you so much for the blog. Myself and my partner were planning on visiting at the end of Jan to the first week of Feb. I’ve heard mix reviews about these times. What would you recommend? I wouldn’t know why not, go for it! 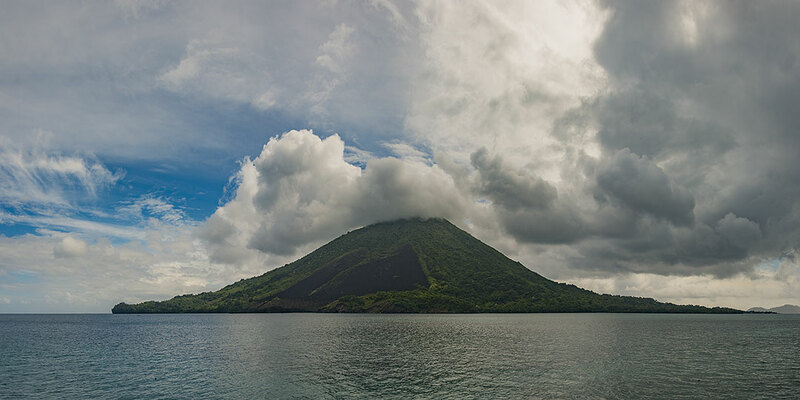 Definitely haven’t heard about Banda Islands but it sure looks amazing. Love the islands that you’ve visited, they look super peaceful! The Cilu Bintang Estate btw looks great. Love the room! This is so candid, I love that local and rural ambiance of the city. It reminds me a lot of my small village in Zamboanga, now I miss it so much. Anyway I’ll be at home soon. Thanks for sharing this! super fun to read I feel like I was there as well. great story, must have been even better back then! Actually, there is a Pelni boat that travels from Banda to Kei and then to Raja Ampat (and back). It will be cheaper than flying, but ofcourse it will take you more time. Looking at Banda and Kei, that’s not a bad thing! July isn’t the best season for snorkeling due to rain season, but when I was there visibility was great. Thanks Martien for the good information. So happy to know that I will visit with my girlfriend in September this paradise outside the beaten path. GREAT !!!!! Thanks. Thanks Manfred, great choice! Have a great time there! There is a new place on Hatta that is absolutely Paradise. All the accommodations charge the same price but this one is a house with 8 spacious, airy rooms built out over the water with a small garden island the size of a city lot out the back door. There is a stairway off the deck into the water and a very nice reef out the back. I saw at least one turtle every snorkel. Excellent tip, thanks! When I was there, I was told about a cool new place being built. I went out for a walk to find it one day, but rain started and I never made it there. Sorry for asking you something important. I told you that my brazilian girlfriend and me will visit Banda in September of 2018. I would like to know if the coral riff on Hatta Island in front of Sarah´s Homestay is a good place also for beginners of diving and snorkeling. Because my girlfriend is a newcomer. I hope to get some response of you. Greetings from Austria and from Brazil. Hi Manfred, for snorkeling it’s perfect, it’s a short walk to the corals and easy snorkeling. I’m not aware of diving details at this location, I’m sure you can I doubt it’s a hard location, but you’ll probably have to organise it from Banda island. You could easily have yourself dropped off at the island at the end of the day and return another day with the local boat to Banda. You’re gonna have a good time! Ask around for the new guesthouse at Hatta, I heard it’s really nice and has great snorkeling in front of it as well. Thanks for the good information. We just travelled there and really enjoyed our time! Thanks so much, glad to hear the blog helpend and you enjoyed it! Hope you didn’t have such a hard time getting there & away, as I did!? Thank you so much for sharing… I have a question about the weather conditions, so many different stories about heavy winds, rainy periods etc. What would you recommend? When did you visit? I visited in June which was right in rainy season. I would not recommend those months, as there is barely any transport to/from Banda. You’ll depend on the 3 Pelni ferries, which only come once or twice a week. In my case there wasn’t a boat in 2 weeks.